Exploring Austin with Kids News - Summer Special! 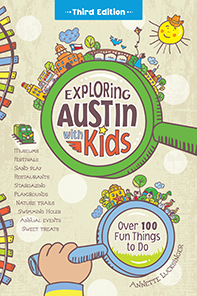 In celebration of summertime adventures, order your copy of Exploring Austin with Kids and get 20% off and free shipping! * Get new ideas for summer fun, from swimming holes and stargazing to farm tours and underground bowling. * Discover the free places and the free hours at your favorite museums. * Stave off boredom by flipping the book open to a random page, and head that way! * Download the app to uncover new parks, pools, and splash pads as you head through the city. * The guidebook makes a great gift for birthdays, baby showers, or grandparents too. Offer good from now until June 21st.